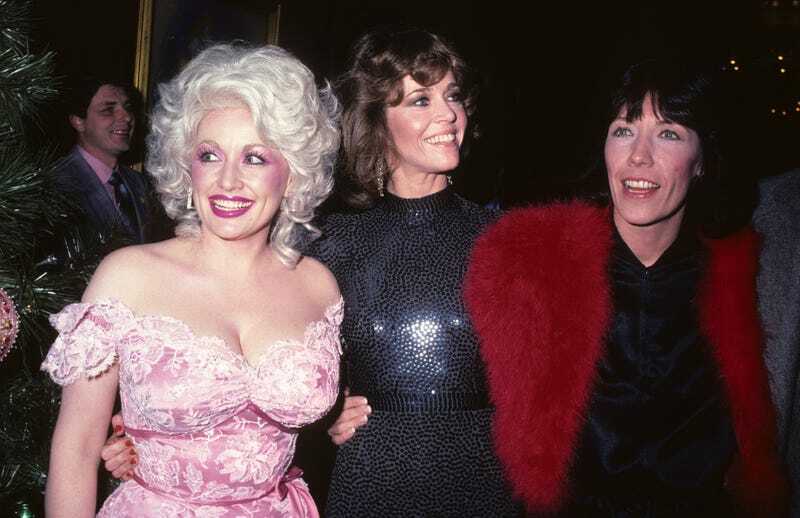 There’s more exciting news out of Dollywood, as Deadline reports Dolly Parton is considering going back on the job with Jane Fonda and Lily Tomlin for a 9 To 5 reboot. 20th Century Fox is developing an updated version of the 1980 feminist comedy, which was written by Patricia Resnick along with the late Colin Higgins, who directed the film. It was a commercial and critical success, and has already been adapted for Broadway. 9 To 5 starred Parton, Fonda, and Tomlin as three employees who take revenge on their sexist, boorish boss (played by Dabney Coleman). The talented trio had a brief reunion last year, when Tomlin received a lifetime achievement award, but the reboot would see them reprise their roles and advise a new generation of women battling misogyny in the workplace. Word is the studio wants Resnick to team up with Rashida Jones on the new script in order to “make the concept relevant to a young comedy audience,” presumably because holding your boss hostage is probably not the best way to deal with the wage gap. With Parton likely to star in some capacity, maybe she can cover her own hit song.